Do you like your coffee? Us too! But not the acidic varieties-no definitely not! This is where cold brewed iced coffee comes into the mix. 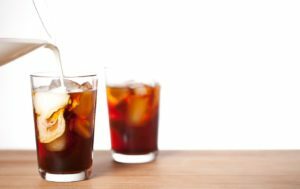 Cold brewed iced coffee makers make smooth, delicious and healthier coffees compared to those you get from regular coffee makers. You can store cold brewed coffee in the refrigerator for up to a week and use it for making hot or cold coffee without any wait time. An ideal cold brew iced coffee maker should give you cold coffee with a balanced aroma. It should also preserve the fruity, earthy, nutty or chocolatey flavors which good coffee has to offer. Additionally, a cold brew iced coffee maker should look attractive and must be easy to clean and store. 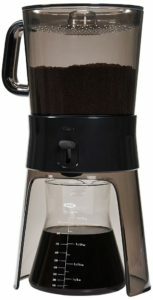 On the basis of these requirements, I have shortlisted 5 of the best cold brew iced coffee makers that I have used and loved. What I like about it: Cold Bruer is super easy to use. I recommend you experiment a bit with its brewing times, the beans you use and temperatures. On the downside, the drip frequency is difficult to adjust on this one. Other than that, I love the coffee flavor obtained and the strength of the brew is likely to be perfect for most people. What I like about it: The Oxo brews delicious, low-acid coffee and this is the only cold brew iced coffee maker that evenly distributes water for optimal flavor extraction thanks to its Perforated Rainmaker™ technology. The small and compact design makes it ideal for easy storage. The stainless steel filter is easy to clean. On the downside, you’d need slightly coarse ground coffee for optimal taste. What I like about it: The Hario Mizudashi is available in two sizes and the 1000 ml size easily brews 4-5 cups of fresh delicious coffee. It is easy to clean, pour and dishwasher safe. Just like the toddy coffee brewer (which I will review next), the Hario does not have an additional filter and makes smaller batches of coffee which many people prefer. The best part: it is much cheaper compared to the Oxo and Cold Bruer without compromise in taste. Note that you need to use very coarse ground coffee with it for a strong brew as anything fine will make your coffee too watery. 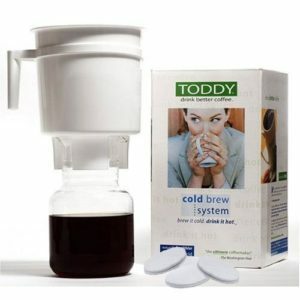 What I like about it: Toddy cold brew coffee maker is scientifically designed to give you coffee which is 67% less acidic than regular coffee. 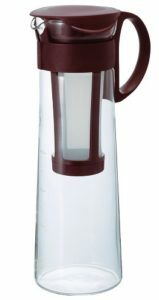 It comes with 4 reusable filters and is also ideal for making hot/cold tea. The best part: you do not need electricity for this! Also, the brewing method is not messy, not labor intensive and certainly not difficult. What I like about it: This is an overnight coffee maker. You only need to add the coffee and steep it overnight for delicious cold coffee. 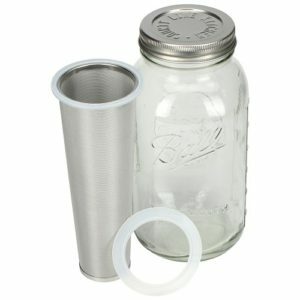 The super fine stainless steel filter prevents grounds from entering your beverages. 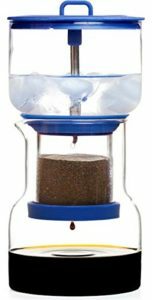 This simple brewer can also be used to infuse fruits, oils, spices and other flavors in water. You can even make delicious cold or hot tea with it. The bell mason jars and other components are free of BPA and consist of FDA approved glass, steel, and silicone.